Talking birds have always fascinated humans and people have spent a lot of time training and breeding birds to hone their ability to imitate the human. Some of these birds are highly intelligent and can also build a vocabulary, contextualise words and imitate emotions. Some species of birds can be very easily trained while some require persistent effort. Here is a list of some of the smartest talking birds. This large bird is found in the forests of West and Central Africa and has acquired fame as one of the smartest talking birds in the world. Talking about the appearance, it has a grey coat on most of its body. However, the eyes are pale yellow and the beak is coloured black. The parrot species is 33 cms in length and weighs approximately 450g. It can live up to 50 years in captivity. They have a large wingspan of about 50 centimetres and are grey in colour with slight dark and light variations in the plumage. Males and females look almost the same. These birds have developed the ability to mimic the sounds of different animals to fool and scare away predators but they are very quick to imitate human voices. They can be trained easily and get very attached to owners. It is also one of the most beautiful parrots in the world. This bird is native to Australia and is a very popular pet around the world for its ability to imitate human voices. It is very intelligent and can repeat whole sentences. In fact, this bird holds the world record for having the largest vocabulary in the animal kingdom as it can remember more than 1700 words. However, in order to be trained to repeat words, it has to be kept alone since it will not follow the owner if it has another bird to live with. Being kept along causes significant distress to the bird and may lead to a shorter lifespan. Budgies are one of the most popular pet birds in the US and UK. 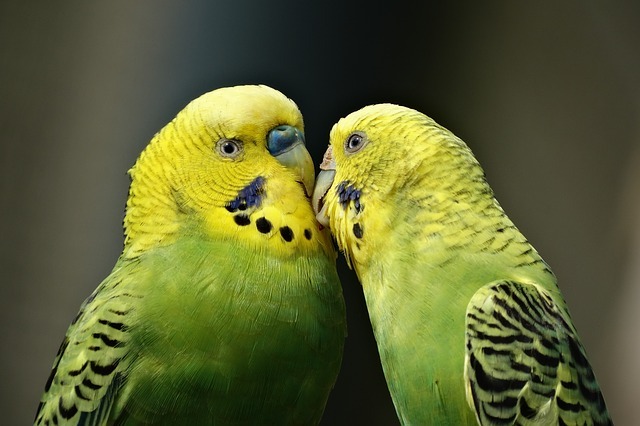 Budgies used to grind their beaks when they are feeling relaxed and happy. You will love to read about small and cute birds in the world. Parrots from the Amazon family generally are excellent at imitating human speech and are popularly kept as pets despite the physical and psychological harm this inflicts on the birds. These birds can be trained very easily and can repeat words, sentences and even songs from an early age. However, they bond only with one human and their ability to ‘talk’ depends on the bond they share with their owner. In the wild, the ability to mimic sounds gives these birds the ability to scare away predators by mimicking the sounds of larger animals. Talking about the appearance, It has a green forehead and a yellow band across the back of its neck. The parrot species is popular for their playful personalities and talking ability. You will also find interesting reading about incredible and amazing arctic birds. This bird is native to the rainforests of New Guinea and is very colourful. Both the sexes of this species look so different that they were considered separate species for a long time. The male has green plumage and a yellow-orange beak while the female has red and purple feathers with a black beak. They are popular pets all around the world because of their ability to mimic words, pleasant sounds and songs they hear repeatedly around them. They also have a very melodious call that they use to attract their mate. Talking about the appearance, the central tail feathers are green in colour, however, the outer being blue. The clour of the bill is orange and black at the bottom. Their population in the wild is rapidly declining because of the illegal pet trade. We also recommend you to read about the most strange looking birds in the world. The Indian parakeet is commonly found across South Asia and is also a popular pet in this region. It can learn and repeat about 200 to 250 words and also sing tunes from songs. Different species of the Indian parakeet have different capacity to repeat words and it also depends on the interaction with the owner and how well the bird id trained. This bird is often used in circuses and road shows because it can easily be made to ‘talk’. It is additionally known as Indian ring-necked parakeets and can grow up to 40 cm in length including tail figures. They love to be in large groups up to thousands. Also, please read about best singing birds in the world. This bright green and grey coloured bird are found in Europe, North America and South America and usually lives in groups. it is one of the smartest talking birds and is also a popular pet in Europe and America. Depending on how well the owner trains the bird, it can learn to imitate many words. If it is properly rewarded during training and words are repeatedly said, it can also understand the context and emotions in which words are said. This talking bird also imitates other sounds it hears repeatedly.The only parrot species that builds a stick nest rather than using a hole in a tree. They are mostly seen in the subtropical parts of Argentina and surrounding countries in South America. Like the Indian Ring Parakeet, the Hill Mynah is also found fairly commonly across South East Asia and is very adept at imitating sounds. Despite this ability, it is not very popular as a pet and is generally found in the wild. More than human voices, it imitates calls of other birds and sounds of different animals. Some species of Mynah are better at imitating human voices than others and if trained well can also mimic the exact tone and pace of human speech. The common Mynah has a dark-brown plumage along with black head, throat and upper breast. It has a yellow beak, feet and skin around the eye. This distinctive looking parrot is found in Southeast Asia and Australia and is easily recognisable by the distinctive shape of its beak. Some species of Cockatoo are better at mimicking human voices than others while some are better at imitating sounds and calls of different animals. The rose-breasted cockatoo, yellow-crested cockatoo and Long-billed cockatoo are popular pets because of their long lifespan and ability to ‘talk’. They can live up to 60 years or longer depending upon the species. The oldest known cockatoo named Major Mitchell’s cockatoo residing in at Brookfield Zoo in Chicago lived for 83 years old (1933-2016). Training these birds can be a bit difficult as words have to be persistently repeated in the same tone and pace in order to get the birds to copy them. It also helps if they are rewarded after successfully imitating the given words. This colourful bird is found in the rainforests of South and Central America and is recognised by the distinctive yellow spot on its crest. Some birds of this species can talk very well while some never do and this depends on a number of factors. The frequency of interaction with humans, a company of other birds, whether it lives in the wild and how well it can be trained are some of the decisive factors. Talking about the appearance, Yellow-Crowned Amazon is generally green in colour with yellow-green on the underparts. They have a dark black edges feathers and a bright red on the edge of its wing and speculum. They have a long lifespan of over 60 years so the trainers have to be committed and patient while handling this bird. This talking bird too is native to South America and is known for the stark yellow face with blue spots near the eyes and beak. It is a popular pet in North America and Europe and can we very well trained to imitate the human voice. One of the smartest talking birds loves to eat Fruit, vegetables and cooked or soaked pulses and good quality seed mixture. It usually bonds only with one human and quality time needs to be spent with this bird to successfully get it to talk. Apart from this ability, the call of this bird is also very melodious. Would you want to have a bird as a pet? It is always a good idea to check how long the bird lives to determine if you are ready to make such a long-term commitment. Some of these talking birds are illegally transported across the world by smuggling them out of the wild. Also be sure to check where your bird comes from and what kind of care it requires. Keeping a bird can be a truly fulfilling experience if done right.